Hotel Zoso's a pretty cool place, lots of modern furnishings and plenty of conference rooms downstairs from the lobby. I went to a Dwell conference there last year. The food at the conference was good, too, but it was only finger food, sandwiches and whatnot. If you're looking for a quiet place under Mt. San Jacinto, this is not the place. 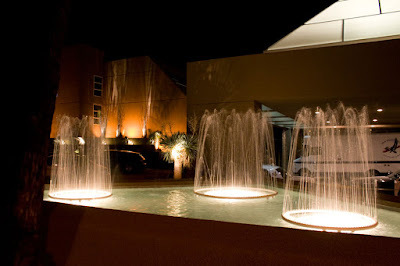 The Hotel Zoso is located on Indian Av., which is a block from downtown Palm Springs' strip. You can walk to coffee shops (Starbucks, Coffee Beanery) and many restaurants. For a great small-town, urban resort getaway, then Hotel Zoso is the hip and cool place .